Despite catchy news events and geopolitical fears, Crude oil hasn’t changed much. 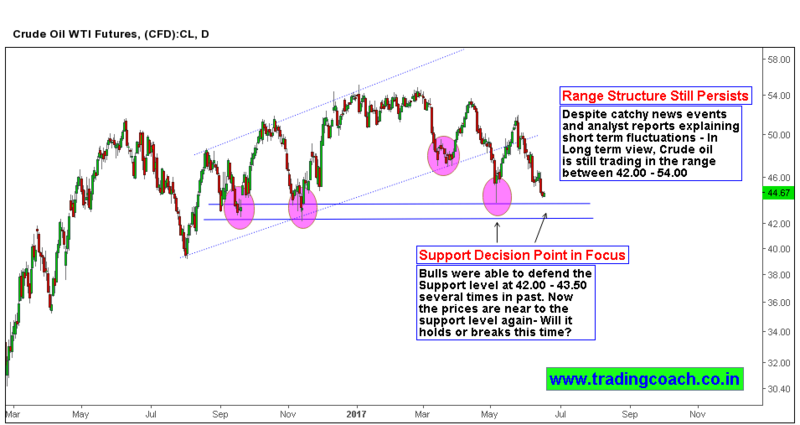 Prices are still trading inside long-term range (which is clearly visible on daily chart), Uncertainty is reigning supreme in oil prices, and Market sentiment has turned more neutral. It’s obvious to note that market prices have found temporary equilibrium at 50.00$ per barrel. Because of that Finding good trades have become a hurdle for crude oil traders and speculators. Market several times tried to breach the upper resistance zone at 54.00 but couldn’t sustain. High and low of long-term range at 42.00 and 54.00 is acting like a traditional support – resistance zone. Since we are in range bound random market, it makes logical sense to look for trades around high and low of the range. Talking about trading opportunity, prices are trading near 43.50 Support zone. Resulting price action can offer trading setups; Traders should watch the price action and take trades accordingly.